Looking like a small sprig from an evergreen tree the wonderful smell and assertively pine-like fragrance and pungent flavor of rosemary goes a long way to flavor to chicken, lamb, pork, salmon and tuna dishes as well as many soups and sauces. As an evergreen, rosemary is available throughout the year. Rosemary grows on a small evergreen shrub belonging to the Labiatae family that is related to mint. Its leaves look like flat pine-tree needles, deep green in color on top while silver-white on their underside. 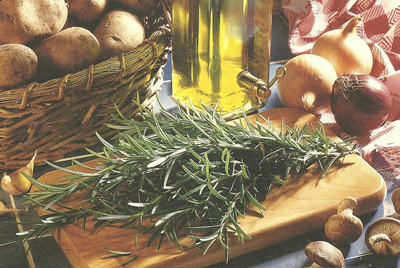 Its memorable flavor and unique health benefits makes it an indispensable herb for every kitchen.The wonderful smell of rosemary is often associated with good food and great times. But it could just as easily be associated with good health. Rosemary contains substances that are useful for stimulating the immune system, increasing circulation, and improving digestion. 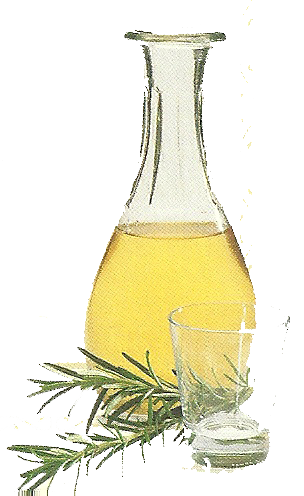 Rosemary also contains anti-inflammatory compounds that may make it useful for reducing the severity of asthma attacks. 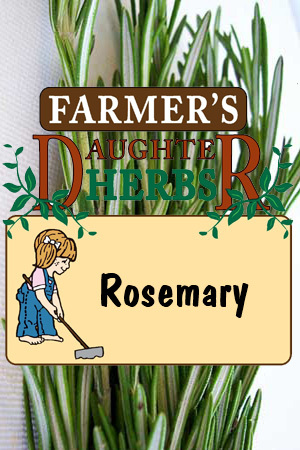 In addition, rosemary has been shown to increase the blood flow to the head and brain, improving concentration. So, the next time you enhance the flavor of some special dish with rosemary, congratulate yourself for a wise as well as delicious choice. 1. Preheat the oven to 450° F. Strip the rosemary leaves from the stems and peel the garlic. Chop both; mix with a pinch of salt and pepper and the olive oil. Rub the lamb with this mixture. 2. Place the lamb in a deep baking dish and roast it for 30 minutes. 3. Wash the potatoes, peel the shallots and chop them. Add the vegetables to the lamb and pour in the broth. 4. 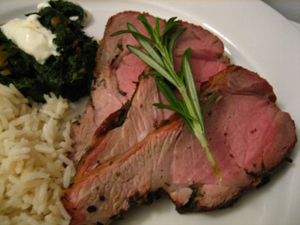 Reduce the temperature to 400° F. Roast the lamb and vegetables for 1 hr. more. Rosemary brightens dull hair, especially for brunettes, stimulates new growth and relieves dandruff. Pour 1 cup of boiling water over 1 tbsp. of minced rosemary. Steep for 15 minutes and strain. Shampoo as usual; then apply the rinse to your hair, working it through to the ends. Do not rinse it out. Towel dry and style normally.